You would think that, in these days of period performance, there would no longer be a role for Mozart’s violin concertos to be recorded on modern instruments. This release is a sound rebuff to anyone who thinks thus. I’ve long been a great fan of James Ehnes, though I’ve rarely heard him in pre-19th Century repertoire. His set of the Mozart concertos is a surprising treat: full of character, ripe with musical insights, and marrying the best of the period style with the best of what modern instruments can bring. The first thing that strikes you is how light and air-bound the sound is, and the effect is a marvellous surprise. The first concerto jumps out of the speakers like a breath of fresh air, with the violin singing over the orchestra like a lark on high. 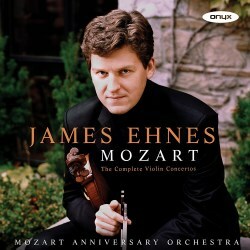 The Mozart Anniversary Orchestra (a hand-picked orchestra of Ehnes’ colleagues, I’m informed) sound small in scale but big in terms of personality, the strings sounding bright, fresh and agile, and the horns integrated into the texture with marvellous clarity. The first concerto’s finale zings along with tremendous energy before the second concerto opens with galant flair and cultured sensitivity. That concerto’s slow movement has the quality of an operatic aria to it, while the finale has all the grace and elegance of a Menuet. No. 4 has similar grace and refinement in its outer movements, but still some infectious energy in its finale, with a slow movement that is elegant and well paced. It’s perhaps a little unfair but, coming so closer together, my natural point of comparison was with Isabelle Faust’s recent set of the Mozart concertos. Despite his excellence, Ehnes isn’t quite in that league, though Faust’s release uses period instruments and is consistently faster. I heard the detriments most in the third concerto, which is not, perhaps, as extrovert as I would often like, though it’s still beautifully lyrical. Similarly, No. 5 has an utterly joyous opening movement, though not quite the dancing-on-air quality of Faust and Antonini. Likewise, there is a sly elegance its main Rondo theme, even if the Turkish interlude is rather too polite. If you’re going to take issue with the set then it will probably be in the slow movements, which can sound rather languid. That’s mostly a problem with No. 3, though it also affects the lovely E major Adagio K. 261. However, on balance that’s a small thing, and for a reading with modern instruments Ehnes broadly solves the “period” problem with great flair. He also writes the cadenzas, and does so having studies Mozart’s own cadenzas for his contemporaneous piano concertos (K. 246 & K. 271). The results are very sensitive and don’t draw attention to themselves for reasons of showiness alone, perhaps the greatest compliment you can pay to a cadenza. This release was recorded a fair while ago, and originally got a limited release for CBC. Newly reissued for Onyx, it deserves to find a wide audience.